When I got the email letting me know that I had been selected for the ACS Publications Travel Grant for the 254th ACS National Meeting & Exposition in Washing D.C., I did a happy dance in my office. I have been the chemistry librarian at Iowa State University for over ten years, but I am not a chemist by training and hadn’t attended a large professional conference like ACS. I didn’t know what expect from the conference, but the grant provided an incredible opportunity. I planned on making the most of my experience by attending educational symposia, social events, poster sessions, and the expo. I started the conference experience hoping to: gain a better understanding of ACS; be inspired; network with other librarians, and learn some chemistry. Most of the educational sessions and social events I attended were part of the Division of Chemical Information (CINF) program. These were well attended, and the members were very welcoming. The social events provided me with many opportunities to get to know other chemistry information professionals. Not everyone was a librarian, but they were all involved in the curation and access to chemical information. I was impressed with the quantity and quality of the presentations. There were usually two symposia topics at one time to choose from; with each talk lasting from 20 to 30 mins. Between the posters, presentations, and social events there were over 140 entries in the schedule for just the CINF division. If I had wanted, I could have spent the entire conference within that one division and been engaged the whole time. It is a credit to the division that I felt welcomed and wanted to be part of that cohort before the conference was finished. I had come to the conference to not only experience CINF but to get a broader view of ACS. I attended a couple of large sessions including the attempt to break the world record for largest chemistry lesson and a Kavli Foundation Emerging leader lecture. While I enjoyed these experiences, I am more comfortable in a smaller setting. I also explored some other divisions of ACS by attending talks from the Division of Environmental Chemistry, Division of Computers in Chemistry, and Organic Chemistry Division presented by faculty from Iowa State. This provided me with an opportunity to not only engage with my faculty but also to learn more about their research. While I didn’t follow all of the specifics of their research, I was able to learn more than I had anticipated. Beyond the presentations, I attended SciMix, the mixed division poster session, and walked the expo floor. Both of these were bigger in scale than I can explain with words and unfortunately, I wasn’t able to get a picture to capture the scope adequately. The poster session was a sea of posters, graduate students, chemists, and refreshments. It was interesting to observe the exchange of ideas in a less formal setting than the presentations. The expo floor was similarly large in scale and scope. Everything from labware to information was represented. 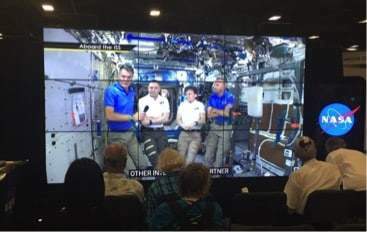 There was even a live stream with astronauts on the international space station about their perspective on the eclipse. One of the highlights of my experience at the conference was my invitation to a private reception hosted by ACS publications. I met people that work for ACS and ACS publications. I often forget how much is involved in the publication of a journal. It was a good reminder that there are so many people working behind the scenes to ensure that these publications have great content and are well put together. This experience wasn’t all learning and networking. In addition to all of the conference activities, I was able to watch part of the eclipse. My favorite part of the eclipse wasn’t observing it directly but seeing the interesting shadowing beneath the trees, which appeared as I moved from one session to another. I enjoyed sharing my glasses with others to see the awe on their faces. It was exciting to experience this event surrounded by so many other enthusiastic people. Before and after the conference (and in some stolen moments in between other conference activities) I was able to visit a few of my favorite places in D.C. and find some hidden gems. The National Portrait gallery will always be on my list of places to visit when in the DC area. 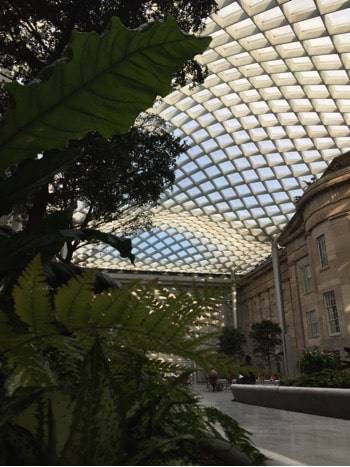 The atrium is beautiful and peaceful. Being in that space allows me a chance to breathe and re-center in the midst of often intense experiences. As for hidden gems, I found some lovely restaurants and gelato shops, but my favorite was a gluten free bakery. Between the excellent programming, lovely environment, amazing food, and even more incredible people, one couldn’t ask for a better conference experience. I got more than I anticipated and it exceeded all my expectations. I am impressed at the conference programming and organization; invigorated by the new knowledge and connections; inspired by my peers; and overwhelmed with gratitude for this opportunity.